LOS ANGELES, CA--(Marketwire - April 30, 2008) - The Valencia Group, a Los Angeles-based restaurant management group, announced plans for the 2009 opening of legendary Trader Vic's in Downtown Los Angeles. The group is currently evaluating several locations for the restaurant near the Nokia Theatre and the Staples Center. "We're trying to find just the right location so we can bring the full Trader Vic's experience back to Los Angeles," said John Valencia, a native Angeleno and Senior Partner of The Valencia Group. "Trader Vic's devotees who have missed the signature food, tiki bar drinks and top-notch service will definitely be able to get it all at the new Trader Vic's LA. Trader Vic's LA will feature the classic tiki decor and atmosphere that helped establish the Trader Vic's brand in Beverly Hills. Most nights of the week, Trader Vic's LA will host live entertainment, including Polynesian dancers and singers. "As Los Angeles natives, we're proud to be part of the Downtown renaissance," said Valencia. "There's a rich history of great fine dining restaurants here and, with the increase in residents and businesses relocating Downtown, we think Trader Vic's will be bustling." Restaurant industry sales are expected to increase by 4.4 percent in 2008, with most people spending 48 percent of their food budget on restaurant dining, according to the National Restaurant Association's 2008 Restaurant Industry Forecast. This report also states that hot food and drink trends include ethnic cuisines and flavors and specialty alcohol. "We are very excited to see Trader Vic's return to Los Angeles," said Sven Koch, Senior Vice President for Business Development and Global Operations for Trader Vics. "The Valencia Group's vision for their restaurant honors our storied past and we are confident that not only will our long time customers be pleased, but that Trader Vic's Los Angeles will attract a whole new generation of fans." Trader Vic's is known for bringing Polynesian dining and entertainment to the U.S. The company's founder, Victor J. "Trader Vic" Bergeron, invented the Mai Tai in 1944, a drink that has continued to enjoy popularity around the world. 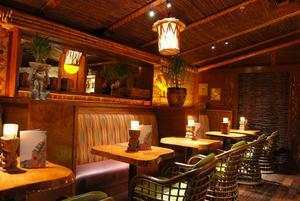 Founded in 1934, Trader Vic's Inc. is a group of company-owned and franchised restaurants. Based in the San Francisco Bay Area, Trader Vic's has locations stretching from the United States to Europe, the Middle East and Asia. For more information about The Valencia Group or Trader Vic's LA, contact John Valencia via e-mail at John@tradervicsla.com. Visit www.tradervicsla.com to purchase your Trader Vic's LA limited edition mug.